Photographer Rev. Michael J. Ahern, S.J. Description This is a view of the altar in the chapel in McAuliffe Hall, in this case set for the Mass of the Holy Spirit. In addition to the representational image of Christ on the cross, the altar also features ornate pillars, an archangel, and decorative carvings of flowering urns. A wood and gold lead urn, along with six long tapers and four short ones are also displayed. 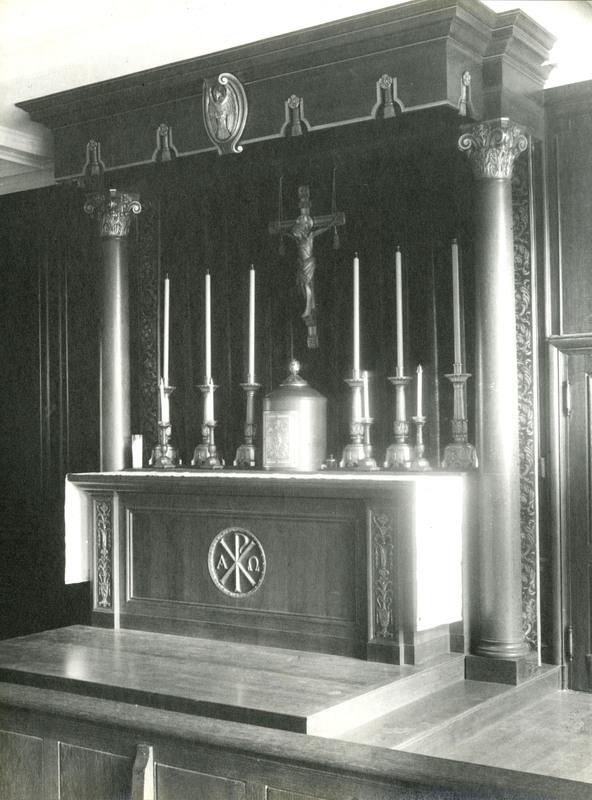 Notes The symbol on the altar is a chrismon, which comes from the Latin phrase Christi Monogramma, meaning "monogram of Christ". This popular chrismon is called a "Chi Rho" which consists of the Greek letters X (chi) superimposed upon P (rho). Often, the rho is formed to look like a shepherd's crook and the chi like a cross, symbolizing Jesus Christ as the shepherd of his flock, the Christian Church. Added to this are the Greek letters alpha and omega, which together are a reference to Jesus Christ's self-description in Revelation 22:13 that "I am the Alpha and the Omega, the first and the last, the beginning and the end." Original Format Photographic print; black-and-white; 8 x 10 in. Digital Specifications These images exist as archived TIFF images and one or more JPEG versions for general use. They were scanned at 400 dpi, 24 bit from the original using an Epson Expression 10000XL scanner.